We were late down for breakfast. Most folk seemed keen to get off, but Brad and Roger joined us for a chat, and Humphrey was as garrulous as ever. More shortbread was distributed, following which (once my new rucksack was packed and repacked) we ran out of excuses not to start. Photos were taken, by the last people we saw before pitching camp seven hours later. Bumbling about around Achintee, we eventually found the correct hill path. After a while it turned into a motorway next to a huge black tube, crawling up the hill like a giant anaconda. The construction workers who were engaged in the destruction of wild land and its conversion to an industrial landscape gave a friendly wave. Luckily there was nobody available from Mr Sloman's office to return a torrent of abuse. Hopefully the new road will blend in better when the work is complete and the debris is cleared. Milkwort and cuckoo flower, common dog violet and yet to flower butterwort, all lined a narrow trod away from the new motorway that led gently via an excellent first brew stop, up to a broad col at 500 metres. Beyond this the path leads to a bothy. We turned off and contoured at around 470 metres. By now, thin gloves had been donned to combat the cool breeze. Some red deer disappeared round a corner, and apart from the tweet of the odd meadow pipit, silence ruled. After oatcakes and tinned fish for lunch, we headed up to the Creag a' Chaorainn ridge. The weather was great. 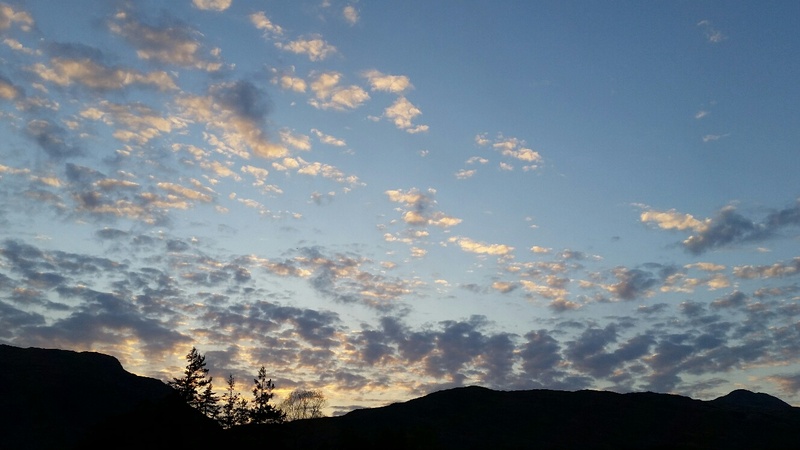 Cloud had risen from the high tops to provide fine views to Skye, Torridon and elsewhere. A short way along the broad ridge, we joined a stalkers path that led us gently to a minor summit at 805 metres. This spot afforded the best views of the day. 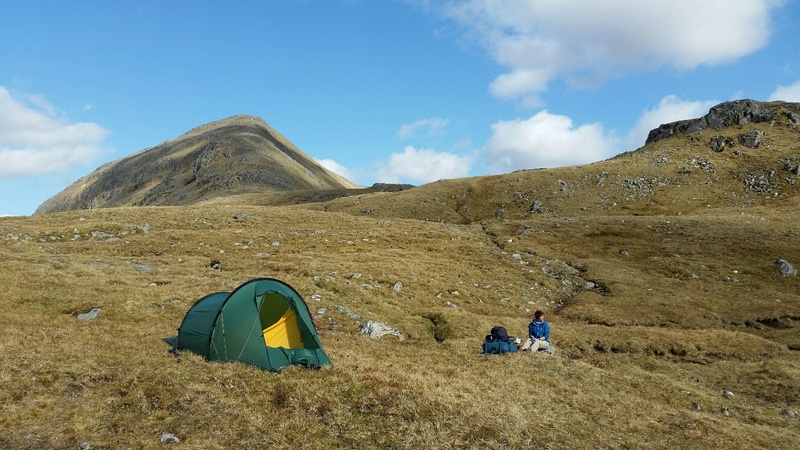 We lingered, wallowing in the delight of viewing the Torridon hills in their full glory. Ben Eighe and Liathach were particularly distinctive in the middle distance. The narrow but distinct path continued enjoyably along Sgurr na Feartaig's two kilometre ridge to its 862 metre summit. Then a steep descent above chasing black grouse found us at the end of our day's walk at Bealach Bhearnais. 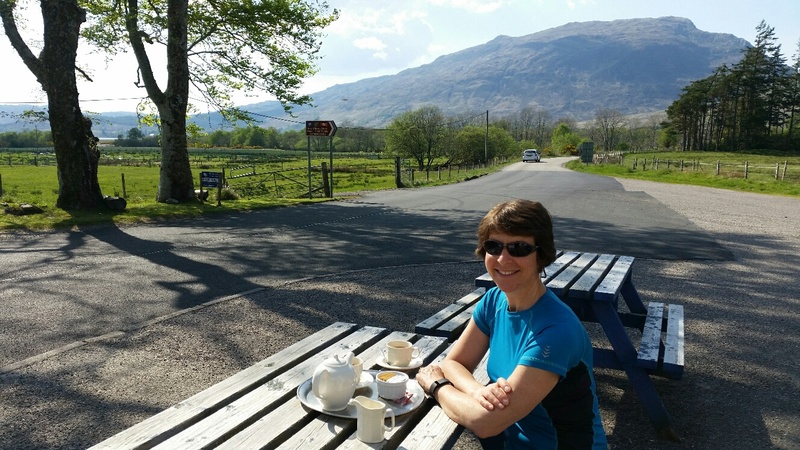 It was breezy at the bealach so we dropped south west for a couple of hundred metres to this calm spot by an embryonic stream. 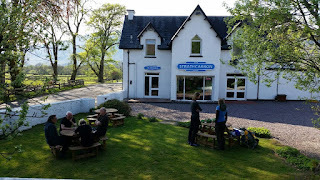 We hadn't seen anyone since setting off from Strathcarron. Humphrey mistimed his arrival. Our tent was up but no brew had been initiated. Humphrey proudly produced his new gloves - £5 from Ikea. They are for 4 - fingered users. I offered to saw off a finger with one of my credit cards. Humphrey declined, produced the components of a drinking receptacle, and rushed off towards a cocktail party. Richard Fuell's timing was much better. We were able to provide him with a mug of tea, after which he wandered off just a few metres to erect his microscopic tent and wrestle with a huge airbed. By 7.30 we had enjoyed a lavish meal before the sun went down, suddenly producing a requirement to engage 'sleeping bag mode'. All we need to do now is brew some hot chocolate and get our heads down for a good snooze. We won't close the door for a while as we have lovely views of Skye from here. No phone signal, so it's anybody's guess when this posting will 'send'. Only one photo as the signal, if I get one, will be weak. We started with a taxi at 5.30. It was a beautiful sunrise in Timperley with our local swifts swooping like large bats in front of the house. David Syme and his friend Mike were the first Challengers we saw - at Edinburgh Haymarket station. The time from Perth to Inverness was passed with two Dutch ladies on a train trip. One of them sprayed us with fizzy water. Sue took revenge by accusing her of being ******. A good smattering of Challengers was to be found on the Kyle of Lochalsh train, onto which we dashed just as it was leaving Inverness, notably our good friend Humphrey, and others too numerous to sensibly identify here. A tub of CCS (chocolate caramel shortbread) was consumed with vigour. 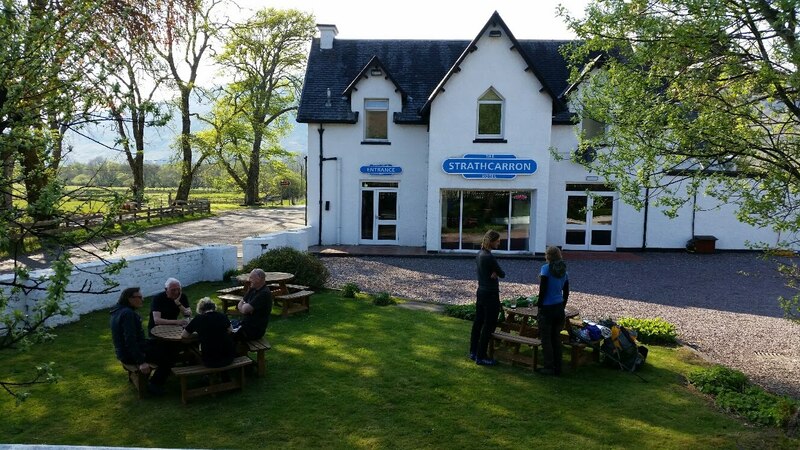 Strathcarron was reached at soon after 3.30. We have a room in the hotel and we were soon ensconced outside with a pot of tea. Others are camping. 38 Challengers are due to leave from here, including Nick, the youngest in the event, and a couple who last did it around 25 years ago. Beer o'clock soon came round and we've enjoyed a most sociable evening in lovely warm weather. But will the fine weather last? Sue and I catch the 6.14 train to Strathcarron in the morning. Our bags are packed for our fifth and tenth crossings of Scotland respectively. 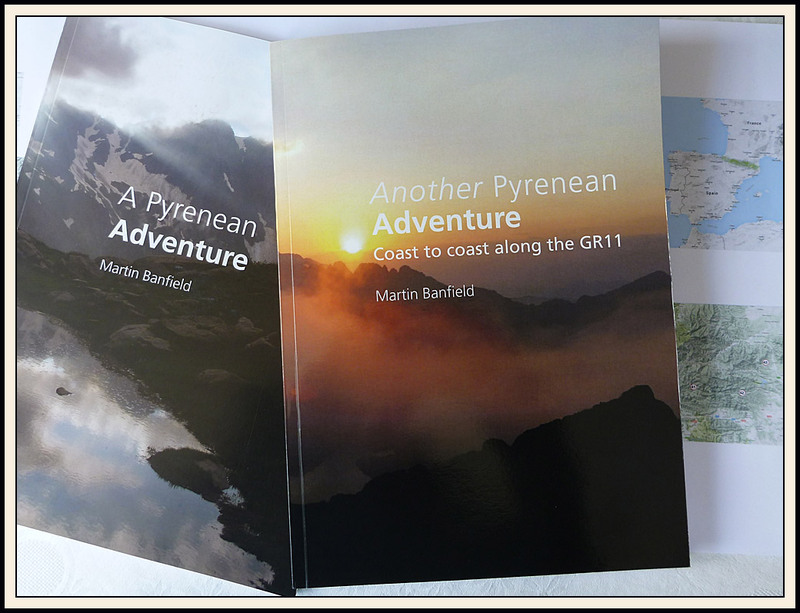 We’ve plotted an easy route – 200 miles with 10000 metres ascent, mostly low level, so we haven’t really paid much attention to the weight of our rucksacks – 15 kg for me and 10 kg for Sue. We’ll be meeting a friend with a car after three days, so any excess gear can be packed off back home then. Our route is shown above: Strathcarron > Struy > Inverness > Grantown > Tomintoul > Ballater > Tarfside > North Water Bridge > Montrose. For the first time I haven’t uploaded detailed route maps to our website, nor have I produced a route card with estimated timings. Will I be lost without that? No. Furthermore, having got maps at 1:25000 on my phone, which also has a GPS application, the Garmin GPS has been left out of the luggage. Anyway, I’ll be reporting briefly as we potter across the country, and we hope to meet old and new friends along the way. We wish everyone a safe and pleasurable stroll and look forward to the party in Montrose a week on Thursday. Here’s Sue, enjoying day two of last year’s event, on An Socach with the north Loch Mullardoch ridge stretching into the distance. When I started this blog in 2007 I was using a Karrimor Jaguar 65 litre rucksack for backpacking. Looking through some recently posted old pictures from 1991, the Karrimor sack looks quite new then. I’ve recently used it in South America and on a Lake District backpack. It works fine but it’s showing signs of wear and at 1900 gm it’s a little heavy, especially after rain; these days it seems the old Cordura fabric is quite capable of absorbing moisture. Not bad for over a quarter of a century of use though. In October 2007 I bought a Golite Quest. It worked well until the hip belt failed after three and a half years. My reviews are here. After reverting to the Jaguar for a while, in March 2012 I acquired a Lowe Alpine Nanon 50:60. It was fine until a key shoulder strap broke last summer as I was struggling across the Spanish Pyrenees. A botched repair got me home, but the rucksack was then binned. My review is here. Since then I’ve been happily deploying the old Karrimor Jaguar, and I’ve stopped using Neo-Air sleeping mats, having reverted to the comfort and warmth of an old closed cell Karrimat. The Karrimat wouldn’t fit comfortably inside either the Quest or the Nanon, but it’s fine in the Jaguar. So I wanted a sack that would take a Karrimat, inside which a dry bag with the rest of my gear can sit. So it needed a bit more volume. After not a lot of research, I shortlisted the Deuter Act Lite range, and the Osprey Atmos 65. Luckily, my local retailer, Alpenstock, stocks both of these sacks. 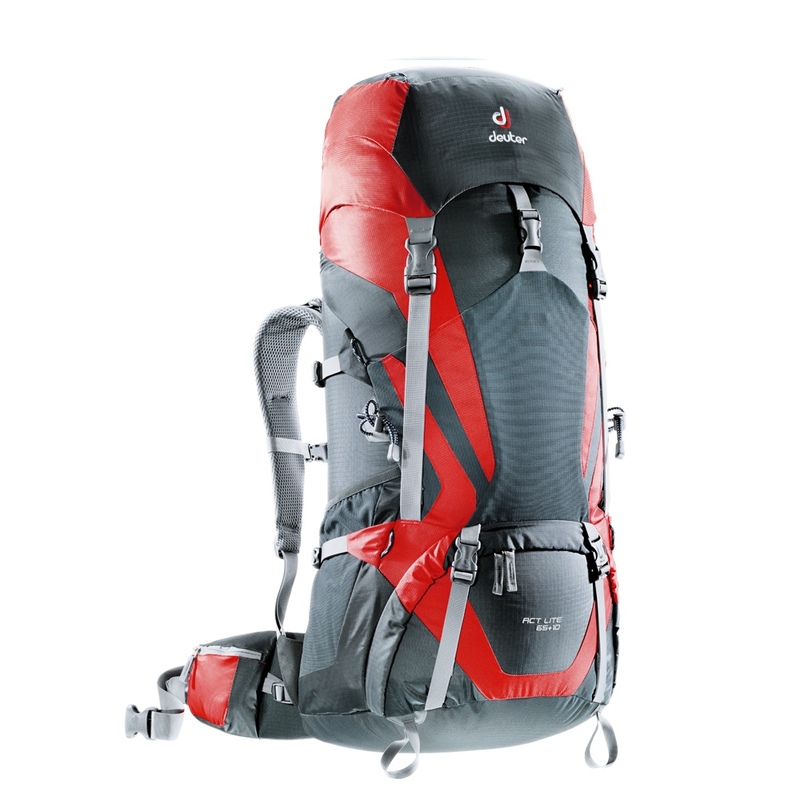 The Osprey has more ‘bells and whistles’ but is heavier than the Deuter equivalent, and it is less stable. I found the Deuter 65+10 accommodated my gear with space to spare. It may be a bit on the big side if I don’t use the Karrimat, but I do still have an ancient but very serviceable Karrimor Alpiniste 50 litre sack to fall back on, and that has additional large removable side pockets. So it was something of a no-brainer. The new sack is a bit heavier than its Golite and Lowe Alpine predecessors, but it seems to be of a more robust construction. Time will tell as to its durability. It’s made of ‘Ripstop 210/Duratex Lite’ and it weighs 1900 gm, the same as the Jaguar. There’s a highly adjustable back system. The hip belt pockets are quite roomy. Here’s a close-up of the Vari Quick back system. There’s actually a second shoulder strap fixing point, so if one of them breaks…. my Lowe Alpine experience won’t be repeated. The hip belt looks very secure. Hopefully my Golite experience won’t be repeated. 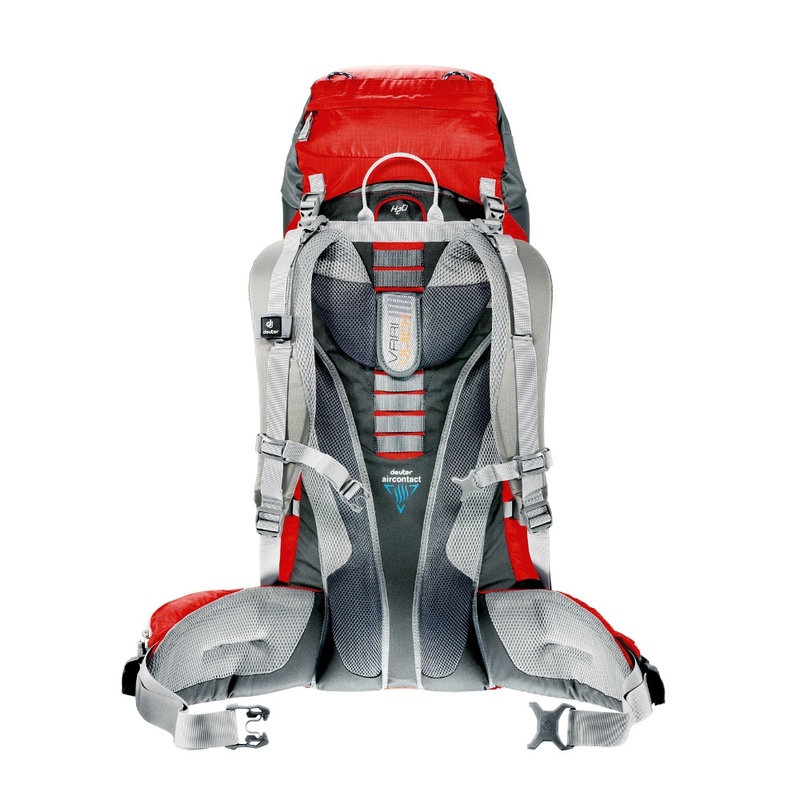 Our freshly revised, sleek packs remain true to their lightweight credentials with their minimal weight and purist, technical design, the ACT Lite models are the perfect companions on any trekking and mountaineering tours. The new, very technical shoulder strap construction features a bilaminate foam and an exact anatomical shape. Lots of more detailed reviews are available, not necessarily showing this rucksack as a ‘best buy’. But having compared it with others, I think it’s suitable for my requirements. I hope so, and it’s going to be thoroughly tested over the course of the next two weeks. Before our encounter with the ‘Perfect Angels’ pictured above, Sue and I had a most pleasurable morning in Wythenshawe Park, where 299 parkrunners turned up on a fine, warm morning, many of whom stayed on for a coffee afterwards. The construction of a temporary roof on the hall seems to be progressing well, with the clock tower having been detached for renovation by specialists who don’t need to be immune from vertigo. This line up of worthies was actually for the purpose of taking a picture of their backs, showing the various ‘milestone’ t-shirts. Red is for 50 runs, black is for 100 runs, purple is for 25 volunteering appearances, and I’m not sure what Paul Muldoon’s yellow shirt signifies. 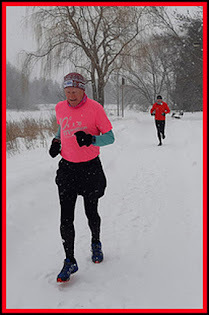 Here’s the picture taken from the back of the runners, nabbed off the parkrun Facebook page. I’m no clearer on the provenance of the Muldoon shirt! After indulging ourselves with a lengthy coffee break and lots of cake, we adjourned to the company of the ‘Perfect Angels’. Walton Park is an easy bike/scooter ride from our house, and a great place to spend the afternoon with the Perfect Angels, who are shown below in the ‘Gallery Barge’ after they had topped up with ice creams – the van must have left the park a few hundred pounds richer! We saw squirrels in the park, and on the way back home we passed this mallard and her nine chicks, playing Russian roulette with some very focussed rowers. We look forward to having you again soon, J and J. Perfect Angels, who should be Seen and not Heard!? I had the pleasure of Andrew’s company again for this morning stroll from Danebridge through the wonderful countryside of the Roaches and Dane Valley areas, though this short excursion didn’t reach the actual Roaches! Instead of our usual direct route past Hangingstone Farm, we chose on this occasion to use the path leading up to Snipe, with good views past lambing sheep to the undulations of Bosley Minn.
Before heading directly north to reach Hanging Stone, the track passes Park House, with fine views across the fields to our objective. A brief but stiff pull up the escarpment leads to the Hanging Stone, and its memorial to Lt Col Henry Courtney Brocklehurst, killed in active service in Burma in 1942. I’ve written in more detail about this here, here and here. By coincidence I’ve just finished reading John Sweeney’s novel ‘Elephant Moon’ set in Burma in 1942. It’s about a party of schoolchildren who attempt to escape from Burma into India in the face of a Japanese invasion. I enjoyed it immensely. Hanging Stone enjoys good views to the south. No recorded hangings have assailed the placid serenity of this Cheshire countryside. Two kilometres along the ‘ridge’, we reached the junction with a lower path that can be taken by those without ambition. Looking back, Hanging Stone, some 70 metres below us, is just about visible in the distance, to the right of The Cloud’s bold outline. Today’s short walk saw us reaching a narrow lane below Bearstone Rock and the Roaches. Sadly, despite the warm weather, there was no ice cream van parked here today. So we sat on a rock and enjoyed a cuppa and some cake. Turning as if on a sixpence, we descended to Forest Wood, below Back Forest, serenaded by cuckoos, following the signposts to Lud’s Church, an unmissable highlight of this walk. The links given above direct readers to postings that provide a detailed history of this wonderful chasm. It was a little damp today, but nothing that the old Keen Targhee trail shoes couldn’t cope with. We met a few people this morning, mostly in Lud’s Church. After passing through the chasm, we headed towards Gradbach to join the footpath beside the River Dane for our stroll back to Danebridge. We’d enjoyed views towards Shutlingsloe for much of the walk. Here’s one of them. A ‘dog lady’ had warned us about ‘mud’. She was correct, but there were always ways around or over it, including one or two boardwalks. The budget seems to have expired in the middle of this one. Towards Danebridge, the woods were full of bluebells – only a short walk from the bridge for those who just want to enjoy the flowers. Soon we were in sight of our destination, which was heaving with people now, having been virtually empty when we set off at ten o’clock. Adjourning to the Ship Inn (see earlier links for its history whereby it is associated with one of a number of vessels) was a mistake. The drinks were pricey and our ‘sandwiches’, which took over forty minutes to arrive, turned out to be tooth risking crispy ciabattas with chunky chips. We’d have preferred a simple, honest sandwich! But others may enjoy the fayre here, and it was friendly enough so don’t be put off. Here’s our route, one that I regard as a classic outing and am always pleased to repeat – about 11.5 km with around 350 metres ascent, taking 3 to 3.5 hours. Click on the map for a slightly larger version.